Eleanor Roosevelt served as the First Lady of the United States from March 1933 to April 1945, making her the longest serving First Lady of the United States. She held press conferences, wrote newspaper columns, hosted a radio show, advocated for human rights and much more. She definitely lived with a purpose! Are you letting life pass you by without stopping to experience all that it has to offer? Maybe it’s time for you to step out and explore and live life to its fullest! There’s no better place to start than right here in Nantucket! We’ve got an abundance of adventures to be had here and in the world of food, there is plenty to experience, especially with the Spring Restaurant Week coming up next week. Nantucket Restaurant Week happens twice; once in the fall and once in the spring. This year, the spring edition is happening June 4-10, 2018 and we would love to have you stop by for this great local event. 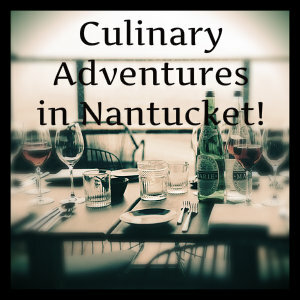 We know it’s right around the corner but there’s no time like the present to take a spur of the moment adventure and see what Nantucket has to offer…and eat some amazing food while you are at it! Restaurant Week is a celebration of the wonderful culinary culture found here. The island has numerous award-winning restaurants, many of which will be participating. Restaurants will be offering three to five course dinners ranging in price from $25-$48. It’s the perfect chance for you to experience exceptional food and wine and either visit old favorites or try some new culinary adventures. Some of the participating restaurants include Brant Point Grill, Boarding House, The Charlie Noble, Greydon House, Nantucket Prime, The Pearl, The Sea Grille, and Ventuno. Greydon House and The Charlie Noble are two restaurants that have only recently opened and have become go-to spots for locals and visitors alike. At Greydon you’ll find classic American food with European flair and at Noble you can enjoy classic, yet progressive New England cuisine. Whatever direction your palate takes you we promise you won’t be disappointed! Book online today to be here for a getaway during Restaurant Week – the chefs put out their best and you will not want to miss it. If you are planning ahead for a summer retreat, we can help you with all of the details—contact us anytime for more information about Nantucket or how we can help you plan the perfect island vacation. This entry was posted in Culinary, Events by admin. Bookmark the permalink.